We hope you'll have as much fun discovering the new areas as we had creating them. Happy trucking! No commercial usage — This work and its content mustn't be used for coomercial purposes. No changes — The work and its content mustn't be changed in any way. 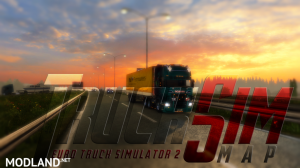 No other download - You are allowed to only download this mod from the officially offered links by the TruckSim-Map team. CAN WE RUN THIS WITHOUT THE DLC BEYOND BALTIC SEA !!!! OR ANY HELP FOR THIS ISSUE OUT THERE !!! No amigos, este mapa no se puede correr sin el DLC baltic sea, asi que a comprarlo amigos.